Speckled scorpionfish larvae (Sebastapistes coniorta) were raised from wild-spawned eggs at 77-79F on wild copepods and artemia. The larval duration was 90 days. First record of Scorpionfish culture. Scorpionfishes (family Scorpaenidae) are cryptic, carnivorous, small to medium-sized, bottom fishes, comprising 45 genera and over 380 species. They are widespread in tropical and temperate seas but mostly found in the Indo-Pacific. Named for their poisonous fin spines, the family includes some of the world’s most venomous species. Many scorpionfish species are commercially important as food fishes due their excellent meat quality. Members of this family have not been cultured largely because of their complicated larval phase. Juvenile Speckled Scorpionfish (Sebastapistes coniorta) reared in the laboratory. The speckled scorpionfish (Sebastapistes coniorta) is a small scorpionfish species (3.5”/9 cm) endemic to the Hawaiian Islands. It is commonly found hiding in the branches of cauliflower and antler corals (Pocilipora sp.) during the day and feeds on benthic crustaceans at night. S. coniorta juveniles were reared from eggs collected in Hawaiian coastal waters. Like other scoprionfishes, this species produces eggs that are embedded in a large, pelagic, sac-like gelatinous matrix. S. coniorta’s egg clusters measure roughly 6 mm in diameter and contain about 75-100 small, oval (0.6×0.7 mm) eggs that lack an oil globule. The newly hatched larvae measure a mere 1.4 mm TL at hatching. They begin to feed on small live foods (<60 um) two days after hatching at 2.1 mm TL. Speckled Scorpionfish (Sebastapistes coniorta) larvae reared in the laboratory. S. coniorta larvae are stunning, developing large, fan-shaped, colorful pectoral fins. The black-dotted, yellow-green-brown fins begin to form at 4 dph (2.5 mm TL) and are largest as the larvae pass through flexion near 20 dph (5 mm TL). Flexion is complete near 26 dph (9.0 mm TL). The late larval (postflexion to transition) phase is long. The first benthic, fully colored juveniles were observed near 90 dph (15 mm TL). 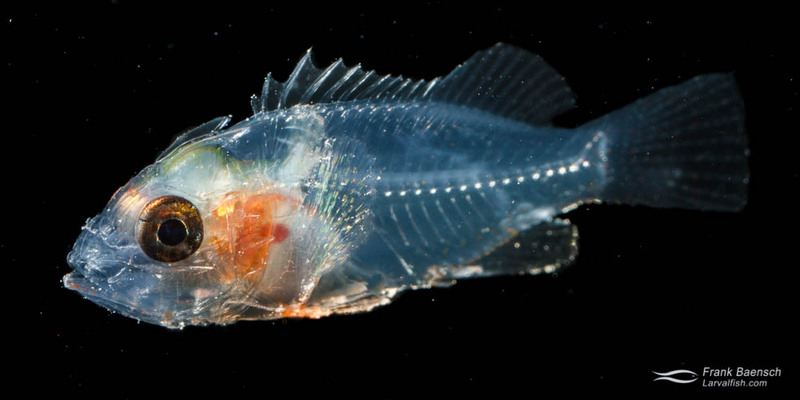 The large, early forming pectoral fins; extensive head spination; and the presence of a swim bladder (which is lost during settlement) are the main specializations to pelagic life of the larvae. S. coniorta larvae are difficult to culture largely because of their small mouth at first feeding; large, delicate pectoral fins; sensitivity to light and organics in in the later stages; and complex settlement requirements. Feeding algae-fortified ciliates and wild copepods, maintaining an exceptionally clean tank environment and reducing light levels during late larval stages were key in raising the larvae.